Tonight I'm having fun setting up a new build server with TeamCity. Since my build server is accessible over the internet, I wanted to use SSL. I also wanted requests using HTTP to be redirected to HTTPS. I ran into a few problems because I was using a wildcard certificate that had been issued from a root CA, while most of the guides focus on using self-signed certificates, but I eventually got it working. Here are my notes in case they help you, or in case I need them later. I'm using TeamCity 7.1.5. I installed TeamCity into a non-standard location, T:\TeamCity, for reasons I won't go into in this post, so of course the paths I'm using below will be different to yours. I secured the PFX file with a password, which I wrote down. Then I copied the PFX file to the server. TeamCity relies on Tomcat, so PFX files aren't much use. The next step is to convert the PFX file into a Java Key Store file. Since these are Java Key Store files, we'll of course be needing a Java tool to do the conversion. But fear not, conveniently there's a Java runtime bundled inside of TeamCity. In my case it's at T:\TeamCity\jre\bin. During this conversion you'll be prompted to enter and confirm a new password for the keystore file that you are creating. 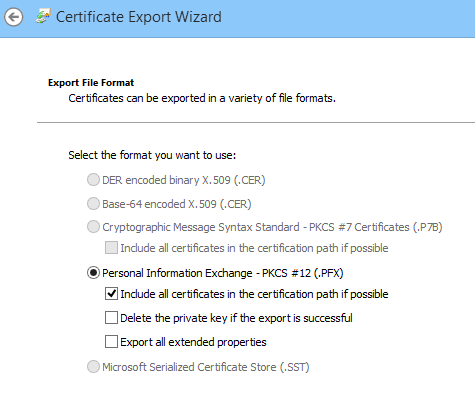 You'll also be prompted to enter the password for the PFX file when it was exported. keystoreFile="T:\TeamCity\conf\.keystore2" keystorePass="<password used for the PFX and keystore>"
The second connector is my HTTPS listener, the first connector just forwards connections to it. At this stage after restarting TeamCity I was able to browse to either http://myserver or https://myserver, but the HTTP endpoint still served the contents over HTTP rather than redirecting to HTTPS. keystorePass="<password used for the PFX and keystore>"
According to Matt, that now handles the WebSocket communication and prevents the "using legacy polling" warning showing up. Also, don't forget to enable port 443 in Windows firewall!